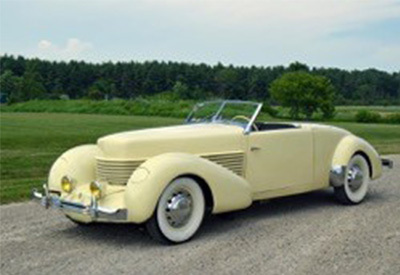 The 1936 Cord 810 was a sharp break from traditional automotive styling, with equally innovative mechanicals. Envisioned as a sporty middle ground between the massive Duesenberg and the traditional Auburn, the debut of the “New Cord” at the November 1935 New York Auto Show was remarkable, with photos showing the joyful madness of the crowd. Many individuals reportedly stood on roofs of other cars, just to catch a glimpse. For an industry in which “totally new” was a worn-out catchphrase, the Cord 810 was truly radical. The Gordon Buehrig design boasted previously unheard-of advancements, such as unitary construction, an underslung floor, completely hidden door hinges and no running boards. Sleek and low, it was known as the “coffin nose” Cord because it lacked a traditional upright radiator. With front-wheel drive and a four-speed transmission (shifting was accomplished by pressing a European-style pre-selector switch on the steering column), it was a glimpse into the future of automotive design. The Cabriolet photographed today was acquired in 1971 by its present owner — a long-term Auburn Cord Duesenberg Club member — and it held the honor of being his first ACD antique car. The car was found behind an old gas station in North Portland. 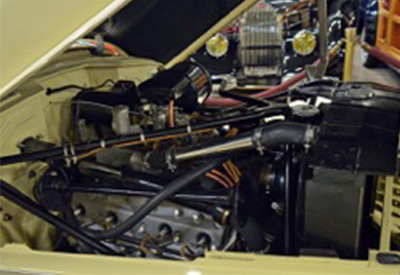 It was restored over a period of several years with the assistance of respected Cord specialists in the Pacific Northwest including, most prominently, the late Wayne Weihermiller, whose skill with the Cord’s notoriously finicky transmission was legendary. Weihermiller carefully rebuilt the transmission and the instrumentation. The car was also fitted with improved front axle U-joints that were developed by LeeRoy Richardson, allowing it to be comfortably and reliably driven for long distances. The Richardson conversion is fully accepted by Cord enthusiasts as a welcome improvement in safety and reliability and are a highly desirable feature. The car’s details are authentic throughout. The older restoration holds up nicely. 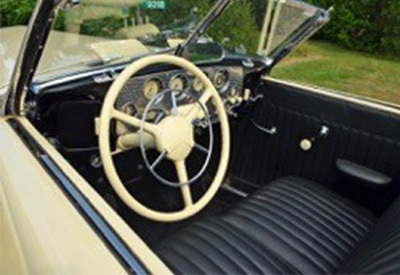 The vehicle features an original bronze windshield frame (which is highly preferable to later re-castings), a correct accessory ashtray and an original, working radio. Although the original engine (FB 1742) was changed out years ago, the original serial number tag remains on the car. Most importantly, because a correct 810 engine was installed, the substitution does not affect the ability to submit it for ACD Club certification by the new owner. 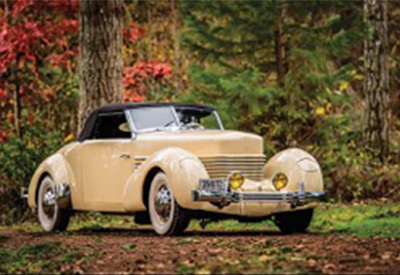 The car is listed as an authentic cabriolet in both of Josh B. Malks’ standard references on the model: Cord Complete and The Timeless Classic. The owner notes that the car is a strong driver, still shifts well after some recent sorting and recently completed a 150-mile tour. This car has only been shown at a few local events and concours over the years, making it an ideal ACD Club or CCCA tour car. A high-quality 810 like this would assuredly be welcomed into nearly any classic car event. It demonstrates the best of early design and engineering. Heacock Classic Insurance operates out of Lakeland, FL, and is a major contributor to the American Modern Insurance Group family. Bob DeKorne has been a licensed Collector Car Insurance agent for over 15 years, but has been addicted to vintage cars and motorcycles far longer. He counts racing on the Bonneville Salt Flats in a 12 cylinder 1926 Pierce Arrow as his finest automotive moment.